You are viewing this Brand New Officially Licensed NFL Football Fan Apparel Item. 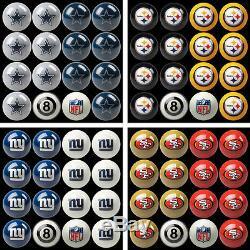 Choose Your NFL Team Home vs. Away Billiard Pool Ball Set - 16 Balls. Support your favorite Team when playing 8-Ball with this Home vs Away Pool Ball Set with Primary & Secondary Team Colors and Logos by Imperial. Show some pride and support for your favorite NFL Team by adding a unique twist to the game of 8 Ball with this Home vs. Away Billiard Pool Ball Set! Use drop-down box above to choose from available Teams and view image! This Billiard Pool Ball Set is made by Imperial International which is the perfect addition to your sports man cave billiard pool collection. Break away from the standard stripes and solids billiard balls by adding some excitement and a new twist to the game of 8 Ball Pool with your favorite Team Billiard Balls. Away Billiard Pool Ball Set features a full set of pool balls, with Seven (7) Balls in the Team's Primary Color & Logos and the other Seven (7) in the Secondary Color & Logos. The White Cue Ball features the Official League Logo and the 8-Ball features referee style black and white stripes. Made of premium quality "A" Grade Polyester Resin and the Graphics are digitally reproduced to ensure your Team's Logos look great! Away billiard ball set is a great way to add an updated look to the game you play while you cheer on your favorite team! This set is designed for games that uses solids and stripes as there are no numbers on the balls with the exception of the eight ball. Set includes 16 Billiard Pool Balls: 7 Home Color, 7 Away Color, 1 Eight Ball, & 1 Cue Ball. Each billiard ball is 2 1/4 Regulation Size and Weight. A must have for any fan, so be the first on the block to have this unique set! Officially Licensed by the NFL. Imperial International History: Imperial started in 1934 as H. Betti Industries, which by the mid 1970's, they had become Imperial Billiards, and during mid 80's, Imperial Billiards became "Imperial International". Since that time, they have grown to provide a huge assortment of game room products, billiard tables, and accessories. With many warehouses and main offices located throughout the US and on each coast; this gives them regional accessibility to service customers both in the U. Imperial's desire to provide high quality products at a reasonable cost remains one of their top priorities! When decorating your game room, choosing an Imperial product will be a great choice since they are one of our leading suppliers of recreational room decor. Product Size: 2.3 Each Ball Product Color: Team Colors, White, & Black Product Material: A Grade Polyester Resin. Customize your game room with high quality products at a reasonable cost! NFL SHOP AT LORRINA'S HOT DEALS. BEST PRICES ON THE NET - BLOW OUT SALE - WHOLESALE PRICING. Visit Our Other Store Items at Lorrina's Hot Deals. Please visit their website to read about important information regarding receiving package. You may or may not have to sign for your package. That is determined by the driver if they can leave it at your door or in a secure place. NO PO BOX Addesses Allowed! INTERNATIONAL BUYERS - PLEASE NOTE. Thank you for your time and business! When your replacement product(s) are reshipped to you, there is no extra cost to you and a return call tag label will be provided for returning the damaged or defective item. We want your shopping experience with us to be a "5 STAR" experience. Once your item(s) arrive, please make sure that your order is correct, intact, and complete. Upon doing this, you will also be able to rate on a scale of 1 - 5 in the four categories. We will make every effort to make your experience top notch! Powered by SixBit's eCommerce Solution. The item "Choose Your NFL Team Home vs. Away Billiard Pool Ball Set 16 Balls by Imperial" is in sale since Wednesday, May 20, 2015. This item is in the category "Sports Mem, Cards & Fan Shop\Fan Apparel & Souvenirs\Football-NFL".